Making custom window treatments and accessories is both an art and a science, combining sewing and “construction,” bringing beauty to life. We’re quite passionate about what we do – down to the smallest detail – and we love to collaborate with interior designers, decorators, and other industry professionals. We’re a full-service drapery workroom, located in the Denver metro area, and we work with clients throughout Colorado. We are able to fabricate just about anything you need – using your design or one of ours. 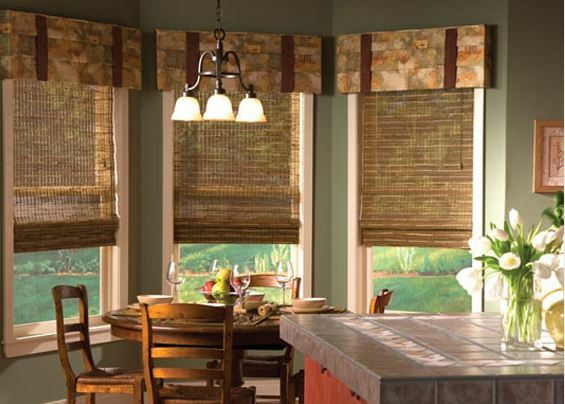 Our top custom window treatments include: draperies, valances, cornices, and Roman shades. We also make a range of accessories and accoutrements, including: pillows, cushions, bedding, and table skirts and runners. Our work is high quality, and we pay attention to all of the details that are required to produce beautiful work, accurately and on time. Throughout the entire process, we double check all our work, which helps avoid errors or complications during the install. We’re pleased to offer free pickup and delivery throughout the Denver metro area, Colorado Springs, Front Range, and foothils. We’re happy to provide a price quote on your next custom project, no matter how big or small, complex or simple. We provide estimates within 1 business day, and the estimate details labor, lining, and yardage. For your convenience, we can also furnish you with our drapery workroom pricing list, so that you can estimate jobs while you’re out meeting with clients. Using state-of-the-art software, we can provide a free custom sketch of window treatments. The sketch is incredibly realistic, and it can help your clients visualize what the window treatment will look like on their window(s). All you have to do is send us a picture of the window (or accurate dimensions), tell us which window covering you’d like to see, and choose a fabric. We’ll then create the rendering, which you can share with your client. Once your fabric arrives in our workshop, we give you a due date, and we meet that date. Typically, our turnaround time is 4 weeks. Depending on our schedule, we can accommodate rush jobs, which do incur a surcharge. For every project, we keep a detailed “Work in Progress” spreadsheet, which we update as fabrics and other materials arrive at our workroom, and as work is completed. Every Monday, we update you on the status of your jobs, so that you know exactly what’s going on. Our drapery workroom isn’t open to the public. Instead, we provide custom window treatments and accessories for industry professionals, including: interior designers, decorators, builders and developers, and retail stores that sell window coverings. If you are a homeowner who would like us to work on a project for you, please contact us. We’ll put you in touch with one of the interior designers we work with, who will be happy to coordinate your project. With every client we work with, we approach the relationship as a trusted partnership. It’s our goal to turn your vision into reality and to support you in what you do so that your clients become raving fans! For further information about our drapery workroom, the project management we offer, or to get a price quote and/or sketch for your next custom project, please e-mail contact@draperyworkroomdenver.com. Please make note: Our drapery workroom is located in Castle Rock, Colorado, and we’re NOT affiliated with the retail store in Centennial.